Bill Gates, founder of Microsoft, lives in a home that is famous in its own right. Located in Medina, Washington, the house itself is over 66,000 square feet and overlooks Lake Washington. Note that much of the house is underground, making it look smaller in pictures. In 2009, Nicknamed Xanadu 2.0, the property taxes cost Bill Gates $1 million a year, with the total house asset value of $148 million. 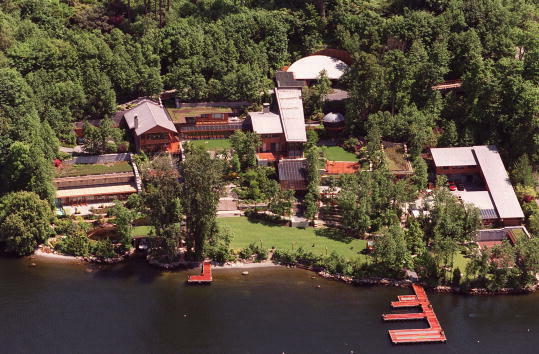 Bill Gates has also spent $14 million buying surrounding property. He bought the original lot in 1998 and contraction took over seven years. The house is considered a modern "Pacific lodge" style design, with many classic and high-tech amenities. To build Xanadu 2.0, all timber and woodwork was flawless, with acoustics being a priority. Over seven types of stone were used. All flooring is heated, including walkways and even the driveway. There were 300 workers total to complete the home, with one hundred being just electricians. The home features all kinds of automation, with over 52 miles of optic cables. Family members and visitors are set up with a microchip tag that can control setting for each room they walk into, controlling lighting, heating, music and even your preference of art on digital displays. All rooms also have their own touch-pad to control every aspect of the room. Intensive home security is present, with hidden cameras and floor sensors everywhere. There are no visible electric outlets and every door handle was custom-made costing $2,000. Some interior passageway doors weigh over 800 lbs, but are balanced for easy opening. Bill Gates has several interesting areas to his home. He has a domed library, which has two secret bookcases, with one hiding a bar. Leonardo da Vinci's Codex Leicester is on display, which Gates paid $31 million for in 1994. The pool house that is 3,900 square feet with a 17 foot by 60 foot swimming pool. The pool is also outfitted with an underwater sound system. His banquet hall covers 2,300 feet and can sit 150 for dinner. The room has a wall made of 24 40-inch video screens that combine into one giant image. He also has a more intimate dining room at 1,000 square feet that can sit 24 people by a fireplace. He also has an underground parking lot which measures 6,300 square feet and can hold 10 cars. He also has two above-ground garages. The strangest addition is his trampoline room which is part of his massive exercise facilities. It features a 20 foot high ceiling for him and all his billionaire friends to bounce around in, probably in a pile of money. Bill Gates also auctions tours of his home to benefit his charity, with one tour selling for $35,000 in 2009. It includes appetizers. He has few rules for his home and family, but one strict rule is no Apple products are allowed!